There were two times during my trip through the middle east when I actually felt unsafe. Being on or around a road in Kuwait was one of them. 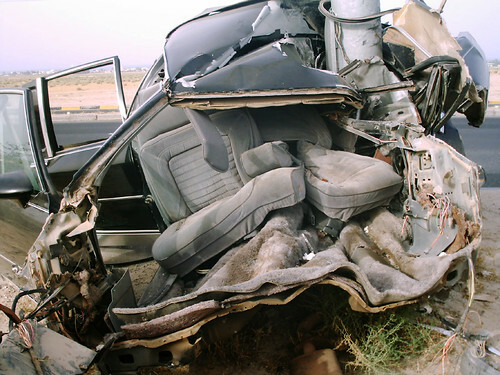 Don’t drive or ride passenger in a car in Kuwait. It’s tantamount to attempted suicide. Apparently Kuwait has one of the highest motor vehicle mortality rates in the world. I’m living in Kuwait at the moment and I think your Flickr sets sum up the driving here – people drive like complete idiots! We’d never normally consider buying a 4×4, but we did here just to be able to drive something substantial. A couple of times a week I have to drive up the 40 and the 6th ring road at about 8pm. It’s very nice to park up in Salmiya after that and sit down with a cup of tea to calm my nerves! It’s pretty normal to have lost an immediate family member (let alone extended family members and friends) to car “accidents.” Coincidentally, the blatant and pretentious lawlessness which in large part causes the insane car-related death rate has to do with a justice system that — excuse the vulgarity — has no balls. As my brother’s brother-in-law put it (he’s married to my sister-in-law’s sister…got it? ), “Respectable people in Kuwaiti society don’t aspire to be cops here.” As long as your car is registered under the right name, you can do just about anything in, with or around your car and not be bothered by an annoying cop until you’ve actually killed someone. Even then, it highly depends on whether you’ve killed someone “important” (or someone with close ties to someone important), and how important they are compared to you. The wealthy, spoiled brats of the country (both the hormonal youth and older, immature hot-heads) know this, and they exploit it. This entry was posted on Saturday, August 30th, 2008 at 04:23 and is filed under Middle East. You can follow any responses to this entry through the RSS 2.0 feed. You can leave a response, or trackback from your own site.